Wow! It's beautiful! Historical inaccuracies are a bit disturbing but it's worth tuning in to enjoy the costumes! 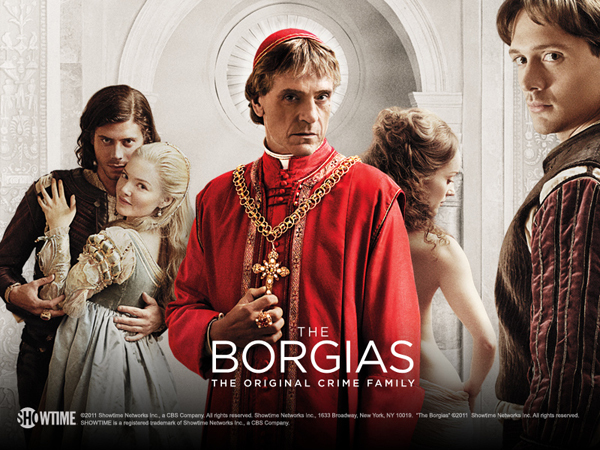 It did not surprise me in the least to discover that the costume designer for this series is the extremely gifted, academy award-winning Italian costume designer Gabriella Pescucci. Gabriella Pescucci has caught my attention many times with her talents, perhaps you have admired her work without knowing who she was, there is a list of her projects here. She studied at the Accademia di Belle Arti in Florence and has worked with some of Italy's most famous costume designers, directors, filmakers and theatres. She worked with the Tirelli Costume firm in Rome, click on their name to explore their website for some eye candy! If you can make it to Turin for the 150th anniversary celebrations, you can check out the Fashion in Italy exhibit at the Venaria Reale under the art direction of Gabriella Pescucci and Franca Sozzani which has some pieces from the Tirelli collection. There is an interview with Gabriella Pescucci in the book Costume Design by Deborah Nadoolman Landis, and you can feel the love of what she does through how she describes working on costumes and with fabrics. Here you can see a short video of her talking about how she enjoys her work, and here there are a few seconds of her describing her work (with subtitles) on The Borgias (at 1:40). Explore the Showtime website Borgia Wiki for more on the costumes of the series, as this show is brand new there is not a lot of material there but they add more after each episode. While admiring the geometric designs of Puncetto on this blog, I remembered seeing some unusual Puncetto work at the Poldi Pezzoli museum in Milan. I marvel at the skill and imagination and would love to know how to create these motifs! I was lucky enough to download a copy when TuttoRicamo was still an active website, sadly their collection of downloadable books is no longer available. **Update, Tuttoricamo has been reborn in blog format, so I have updated this link! There is a lady in Israel who is making nice progress figuring out how to do Puncetto and she's even done some animated YouTube videos. Check out her blog for the whole series of instructions! Special thanks to Stefania for the photos from the Poldi Pezzoli museum! 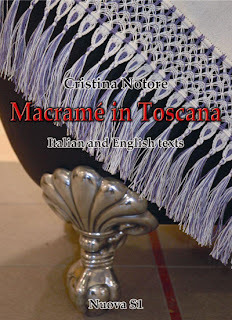 I have been asked to tell you a bit about Italian Macramé Fringes for things like towels, placemats, tablecloths and other household furnishings. 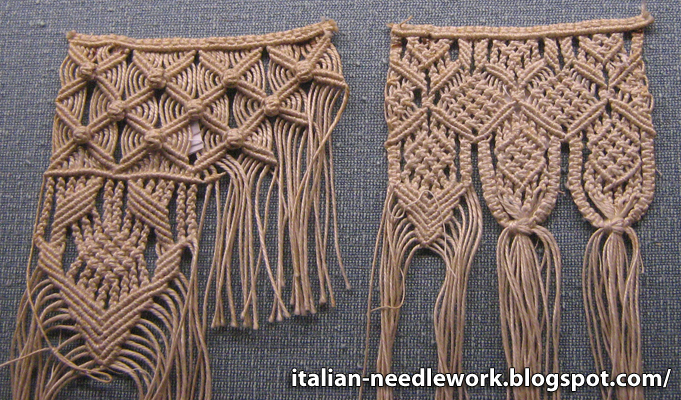 North Americans tend to think nostalgically to the 1970s and hemp macraméd plant holders and the like but in Italy, Macramé is still very much alive in the textile arts and in use frequently. I showed you some summer Macramé purses that I saw in a shop window in Cesena and we talked about tassels and Macramé here and here. 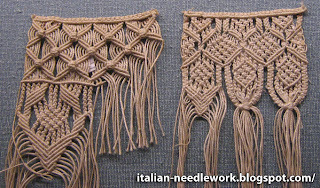 What I saw most often in Italy however were Macramé Fringes of both the simpliest and the most elaborate combinations, all making the finishing touch on very attractive pieces. 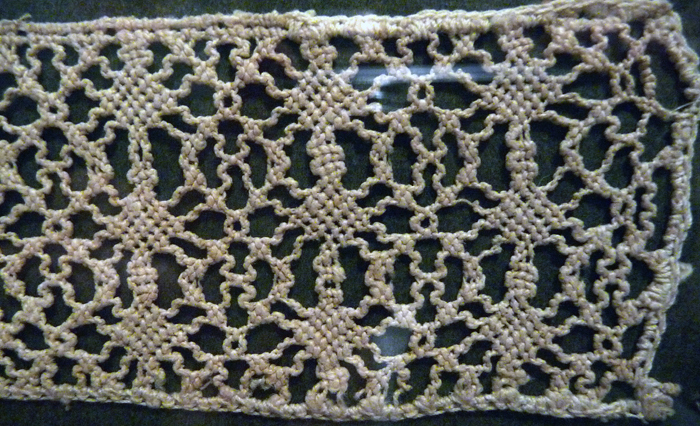 In the Collezioni Comunali d’Arte Museum in Bologna there are several exquisite Macramé Fringe samples. Here are a couple of my photos which turned out, there were many others but alas, my photographs are terrible! 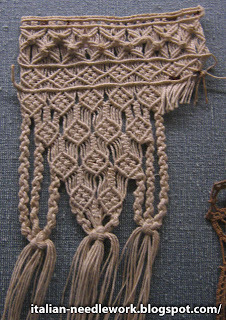 These Macramé Fringes are very small and delicate. 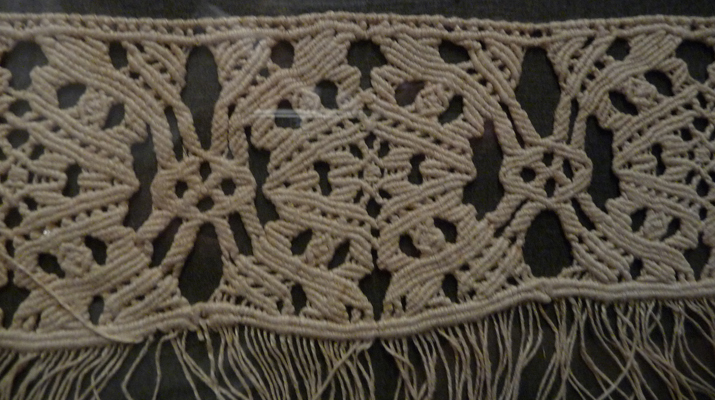 It has many clear colour diagrams and lots of full colour photos of magnificent Macramé Fringes. 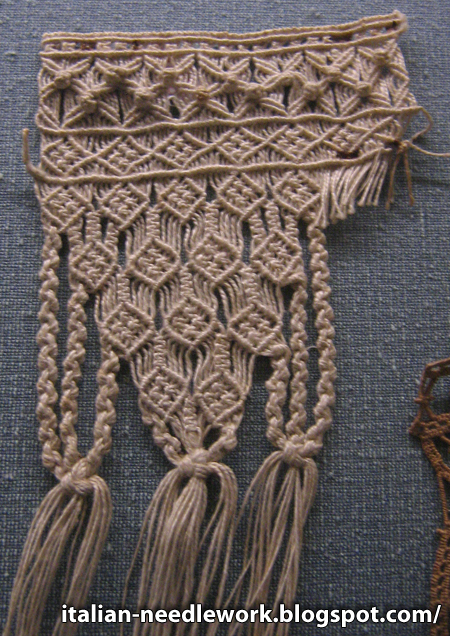 Macramé Fringes are worked on pillows, held either in the lap or on a tabletop, covered in striped or gingham fabric to be used to keep the knots lined up all the way across and evenly spaced. Large-headed pins keep the work securely fastened to the pillow. Materials used can be the warp threads of the actual furnishing you are making the Macramé Fringe for, Pearl Cotton, Cotone Povero or just about anything you like. A crochet hook helps with the pulling through of threads. Special thanks to Stefania for the photo from the Poldi Pezzoli Museum! Oh to be in Bologna in springtime... this springtime! At the Museo Davia Bargellini, Strada Maggiore, 44 in Bologna there will be an Aemilia Ars exhibit called: Aemilia Ars: merletti di inchiostro per merletti di filo. 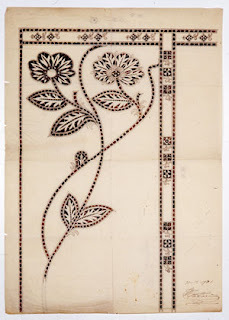 [Aemilia Ars: ink laces for thread laces] It is an exhibition of antique designs from the Aemilia Ars workshop, purchased by the City of Bologna in 1937. The exhibition is 30 antique designs from the early 20th century drawn for the embroidery and lace section of the Aemilia Ars Society. Sketches of large tablecloths are exhibited alongside detailed drawings, designed by Alfonso Rubbiani, Alfredo Tartarini, Alberto Pasquinelli and other designers who prepared them in order to aid embroiderers and lacemakers to create with the needle the refined and much sought after textile products which were sold around the world. 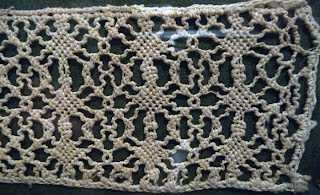 Thanks to the efforts of the promoter of this commercial company, Lina Bianconcini Cavazza, at the end of the nineteenth century a new technique of needle lace was developed, today commonly called 'Aemilia Ars', suitable both for reproducing the drawings published in sixteenth and seventeenth century pattern books and to create works in line with the contemporary Art Nouveau taste; an essential step in the realization of the artefacts was the preparation of designs with specific characteristics which established artists performed by translating these cultural stimuli. For the occasion of the exhibition Aemilia Ars: ink laces for thread laces, some events are dedicated also to modern 'Aemilia Ars lace' - at the Davia Bargellini Museum you can admire the lace and embroidery workshop's original designs which are usually kept in depositories to better ensure their conservation. These valuable materials will be able to interact with some examples of decorative ironwork preserved in the first room of the museum, in particular the spectacular sign of the Sante Mingazzi workshop and the refined gate of the Matteucci of Faenza company; in fact, these craftsmen were themselves a part of the artistic craftsman redevelopment project sponsored by the Aemilia Ars Society, active from 1898 to 1903. Other events in conjunction with the exhibition will be three presentations sponsored by the Italian book store Feltrinelli in Piazza Galvani: a volume published for FENDI about the ability of Italian handicrafts; the books dedicated to Aemilia Ars needle lace produced by the Association Il Punto Antico of San Giovanni in Persiceto and a free workshop on the making of Aemilia Ars needle lace by teachers from the Association Il Punto Antico. The event inauguration will be April 9th at 5pm at the Museo Davia Bargellini. 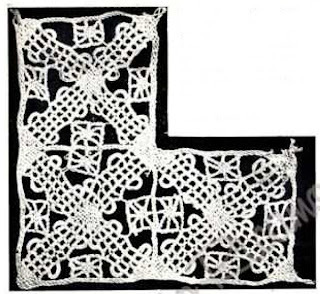 If you are in Bologna for this event, do not miss the stunning collection of needle lace pieces at the Collezioni Comunali d'Arte Museum!!! 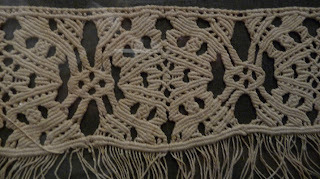 Just a quick note today about a website with some fantastic patterns for Assisi Embroidery (among many other types!). Worth a look and some time spent exploring! Check out Jos Hendrik's website Embroidery and Embroider. Special thanks to Marnie and her Country Fried Stitches blog, without her I would never have discovered this wonderful source of patterns!